I want to say there are a LOT of very hard to pronounce Hawaiian names in our blog…but stick with it it’s a real good one! We are going to start with a basic lesson exactly who Tutu Pele as I have always called her is and her place in Hawaiian mythology. In the Hawaiian religion, Pele is the goddess of fire, lightning, wind and volcanoes and is the creator of the Hawaiian Islands. Often referred to as "Madame Pele" or "Tūtū Pele" as a sign of respect, she is a well-known deity within Hawaiian mythology, and is notable for her contemporary presence and cultural influence as an enduring figure from ancient Hawaii. Epithets of the goddess include Pele-honua-mea ("Pele of the sacred land") and Ka wahine ʻai honua ("The earth-eating woman"). 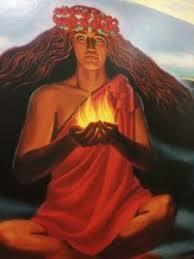 In different stories talking about the goddess Pele, she was born from the female spirit named Haumea. This spirit is important when talking about Hawaii's gods due to how she is a descendant from Papa, or Sky Father, who is a supreme being. Due to Pele being born, she has become a notable deity known to the Hawaiian culture. She is also known as "She who shapes the sacred land", known to be said in ancient Hawaiian chants. Kilauea is a currently active volcano that is located on the island of Hawaiʻi and is still being extensively studied. Many Hawaiians believe Kilauea to be inhabited by a "family of fire gods", one of the sisters being Pele, who is believed to govern Kilauea and is responsible for controlling its lava flows. There are several traditional legends associated with Pele in Hawaiian mythology. In addition to being recognized as the goddess of volcanoes, Pele is also known for her power, passion, jealousy, and capriciousness. She has numerous siblings, including Kane Milohai, Kamohoalii, Namaka and numerous sisters named Hiiaka, the most famous being Hiʻiakaikapoliopele (Hiʻiaka in the bosom of Pele). They are usually considered to be the offspring of Haumea. Pele's siblings include deities of various types of wind, rain, fire, ocean wave forms, and cloud forms. Her home is believed to be the fire pit called Halemaumau crater, at the summit caldera of Kilauea, one of the Earth's most active volcanoes; but her domain encompasses all volcanic activity on the Big Island. Pele shares features similar to other malignant deities inhabiting volcanoes, as in the case of the devil Guayota, of Guanche Mythology in Canary Islands(Spain), living on the volcano Teide and was considered by the aboriginal Guanches as responsible for the eruptions of the volcano. Legend told that Pele herself, journeyed on her canoe from the island of Tahiti to Hawaii. When going through with her journeys, it was said that she tried to create her fires on different islands, but her sister, Namaka, was chasing her wanting to put an end to her. In the end, the two sisters fought each other and Pele in the end was killed. With this happening, her body was destroyed but her spirit lives in the Halemaumau crater on Kilauea. They say, "Her body is the lava and steam that comes from the volcano. She can also change form, appearing as a white dog, old woman, or beautiful young woman". Pele is often said to be seen walking the Halemaumau crater road looking for rides into town. Here is a story told many times and by many different people….. Hi, my name is marissa and this happened on the Big island of Hawai'i. My parents and I were looking for our hotel late at night and were getting frustrated. Then, we saw this old lady sticking her thumb out on the side of the road. She looked innocent with her long, gray hair and wrinkled face so we picked her up. We asked her where she was going and she said "Kona", which is a city on the island. 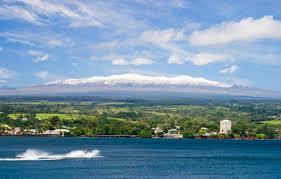 Now you have to imagine this: We were in Hilo which is about 100 miles from the Kona coast. I secretly knew that my parents were hesitating about taking her to her destination because it was so far and it was about 9:00 at night. Kona can be pretty dangerous at night. So I looked at her and she was just gazing out the window, although the way to Kona was pitch black because the city doesn't have much streetlights. She asked my parents for a cigarette and they didn't smoke so they offered to drive her to get some. She said "mahalo" and patiently waited. About 5 minutes later when I checked on the old woman, SHE WAS GONE! She couldn't have got out of the car so fast! We had a van with locked doors and she simply dissapeared! I asked my mom and dad if they had let her get out and they said they didn't. What do you think? I think it was Pele* in her old woman form. In addition to her role as goddess of fire and her strong association with volcanoes, Pele is also regarded as the "goddess of the hula". She is a significant figure in the history of hula because of her sister Hiʻiaka who is believed to be the first person to dance hula. As a result of Pele's significance in hula, there have been many hula dances and chants that are dedicated to her and her family. The hula being dedicated to Pele is often performed in a way that represents her intense personality and the movement of volcanoes. This is one legend of Hawaii’s origins that are used to explain actual physical island caharacteristics. In the story Pele, the daughter of Kanehoalani and Haumea in the mystical land of Kuaihelani, a floating free land like Fata Morgana. Kuaihelani was in the region of Kahiki (Kukulu o Kahiki). She stays close to her mother's fireplace with the fire-keeper Lono-makua. Her older sister Na-maka-o-Kahai, a sea goddess, fears that Pele's ambition would smother the home-land and drives Pele away. Kamohoali'i drives Pele south in a canoe called Honua-i-a-kea with her younger sister Hiiaka and with her brothers Kamohoaliʻi, Kanemilohai, Kaneapua, and arrives at the islets above Hawaii. There Kane-milo-hai is left on Mokupapapa, just a reef, to build it up in fitness for human residence. 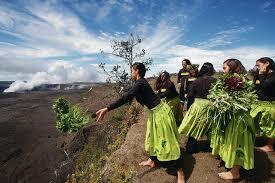 On Nihoa, 800 feet above the ocean she leaves Kane-apua after her visit to Lehua and crowning a wreath of kau-no'a. Pele feels sorry for her younger brother and picks him up again. Pele used the divining rod, Pa‘oa to pick a new home. A group of chants tells of a pursuit by Namakaokaha'i and Pele is torn apart. Her bones, KaiwioPele form a hill on Kahikinui, while her spirit escaped to the island of Hawaiʻi. Pele is considered to be a rival of the Hawaiian goddess of snow, Poliahu. Their opposition to each other make up legend and lore explaining land formations and why Mauna Kea is sometimes capped with snow. The legend tells that Poliʻahu had come from Mauna Kea with her friends to attend sled races down the grassy hills south of Hamakua. Pele came disguised as a beautiful stranger and was greeted by Poliʻahu. 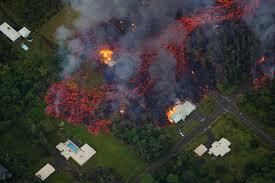 However, Pele became jealously enraged at the goddess of Mauna Kea. She opened the subterranean caverns of Mauna Kea and threw fire from them towards Poliʻahu, with the snow goddess fleeing towards the summit. Poliʻahu was finally able to grab her now-burning snow mantle and throw it over the mountain. Earthquakes shook the island as the snow mantle unfolded until it reached the fire fountains, chilling and hardening the lava. The rivers of lava were driven back to Mauna Loa and Kīlauea. Later battles also led to the defeat of Pele and confirmed the supremacy of the snow goddesses in the northern portion of the island and of Pele in the southern portion. Belief in Pele continued after the old religion was officially abolished in 1819. In the summer of 1823 English missionary William Ellis toured the island to determine locations for mission stations. After a long journey to the volcano Kilauea with little food, Ellis eagerly ate the wild berries he found growing there. The berries of the ʻōhelo plant were considered sacred to Pele. Traditionally prayers and offerings to Pele were always made before eating the berries. The volcano crater was an active lava lake, which the natives feared was a sign that Pele was not pleased with the violation. Although wood carvings and thatched temples were easily destroyed, the volcano was a natural monument to the goddess. There’s a lot of mana (spiritual power) at Kilauea and it’s clear people can feel Pele’s presence when they visit. Occasionally, visitors who make the pilgrimage to Pele’s domain even claim to have seen her unmistakable likeness. Take a look at this amazing photo. 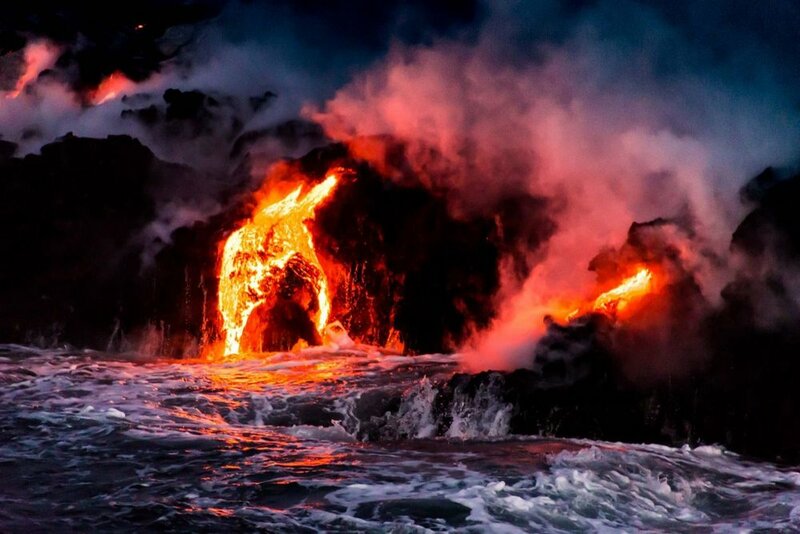 In the spewing magma, the form of a woman appears to take shape between the newly formed land and sea. The “hair” is created when molten lava spatter is stretched into very thin filaments by wind. 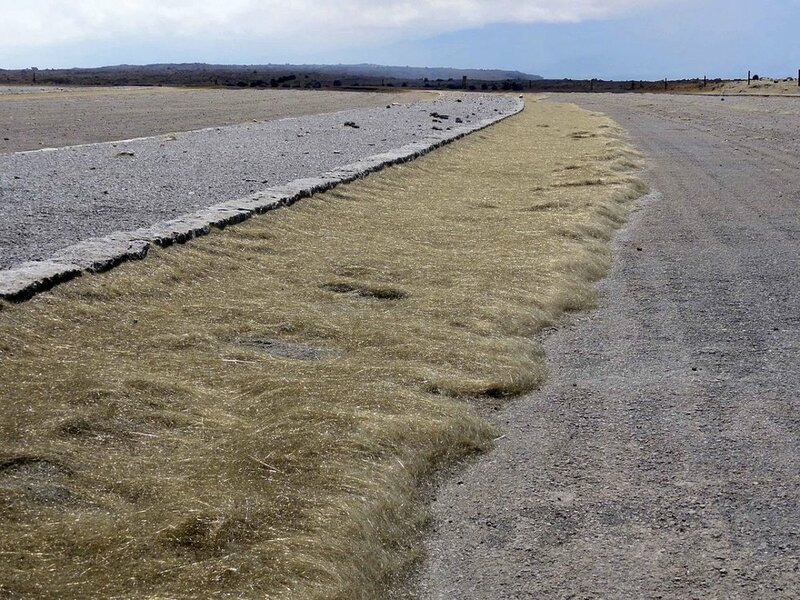 Mauna Iki Trail, in particular, is known for its abundance of Pele’s hair. In the Kau Desert, there are piles and piles of these beautiful and ethereal creations. Even when not literally seen, Pele’s power and presence is undeniable everywhere on Hawaii Island. Kilauea, Hawaii’s most active volcano, is a constant reminder that the Islands are living and breathing entities. Here’s another retelling of Tutu Pele’s mystical powers….imagine yourself sitting on the lanai with a young Hawaiian girl as she recounts this to you. “My hula sisters and I went on a hula retreat a few years ago up at Kilaueaon the Big Island where, of course, Pele lives. We were walking around the Volcano park one night when something started following us; we could hear footsteps. So my friend was like, "Hey, you guys hear that?" My other friend said, "It's probably a weasel or something," so we just kept on walking. Then we heard barking and we were all scared and didn't know what to do. We walked a little faster, and then it started to get warm. Very, very warm. As we got closer to one of the look outs, we could hear chanting and all of us were freakin' out like crazy. Thats what Hawaiian locals call a chicken skin story because it raises goosebumps on your skin when its told to you! If you’re visiting the Big Isle keep your eyes open for the old woman with flowing gray hair looking for a ride into town. If you see her, respectfully offer her a ride so as not to offend Tutu Pele and have a wonderful “chicken skin” story of your own! Remember VentMask Air filters are made for travel in your hotel room as well as in your home and can help reduce ash and particles that trigger allergy and asthma symptoms while you enjoy the beautiful Hawaiian Islands! Newer PostWildfire....no not the song!